This is a must-read for teens. And for adults. It’s no more only a ‘teen book’ than The Book Thief is a ‘teen book.’ Never mind how the publisher describes it. Read it. Since Code Name Verity deals with espionage, it is hard to give you too much summary—this is one book that will be ruined by that. So—I want you to trust me. There’s everything to love here. Oh—trust the Printz Award Committee as well—it’s a Printz Award Honor book. The basics: A couple of young women become great friends in World War II. They are British—but don’t call the Scottish girl English or you’re in big trouble. One is a pilot, who normally taxis planes for the male pilots, who use them in battle. The other is a telegraph operator. But both are required to serve both secretly and dangerously as the war effort becomes a struggle and Nazi Germany may well overcome all of Europe. Britain is Europe’s final hope. In a flight over Nazi-occupied France, the fighter plane that the young women are in crashes. The survivor is held captive by the Nazis and tortured for information. She is required to write information down, but she includes a narrative of how she and her friend arrived at the moment of the crash. This book is about true bravery—courage in the face of incredible adversity, and not just of the two main characters, but of all sorts of ordinary British servicemen and citizens as well as ordinary French folk who aid the French Resistance. And even a few double-agent Nazis. Sometimes we say there is a breathtaking moment in a book or a movie, and we don’t mean it literally. In Code Name Verity, think of literally sucking in your breath at the shock and being unable to let it out. 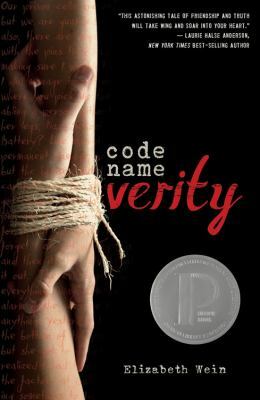 Code Name Verity deals with individual acts, courage, and moral ambiguity. High school housekeeping: I recommend this book for all readers. You’ll learn something about WWII in Europe and the roles of both women and men. The afterword by the author, where she tells us about how she did her research, and how she decided which scenes would be credible and which scenes would have to be left out, is great stuff. You can use this as a fictional springboard to do your own research on many issues from WW II—the Royal Air Force, the French Resistance, women in WW II, fighter pilots, Britain during the war, etc. A little note on the use of the word ‘fag’ in the novel: As you are American teens, you may wonder at the word ‘fag’ used throughout the book—how people are trading them, giving them as gifts, etc. No worries—in Britain (and I believe this is still true) ‘fag’ is a common term for cigarette. In fact, there’s a history behind that use and the derogatory use of the word for a gay man. You could research it. Very sad. This entry was posted in Adventure Stories, Fiction, Historical Fiction/Historical Element, Horror/Mystery/Suspense, Human Rights Issues, Young Adult Literature and tagged book reviews, espionage, fighter pilots, French Resistance, friendship, Nazis, pilots, spy stories, women air pilots, World War II, YA fiction, YA literature. Bookmark the permalink.